You can use the filters to the right to narrow posts by year. We were pleasantly surprised to see that the New York Times picked up (and published in both print and online) the story about our Meals on Wheels event this month.Â From their Wheels Blog ... "ClichÃ©s are best avoided, but when a Lamborghini Gallardo Spyder or a Bentley Continental GT is enlisted to ferry hot meals around town, the fast-food rejoinders naturally follow.On Monday, volunteers working with the Pascack Valley, N.J., chapter of Meals on Wheels were chauffeured to the homes of elderly people in cars provided by Gotham Dream Cars, an exotic-car rental company and club with locations in Englewood, N.J., and Miami. 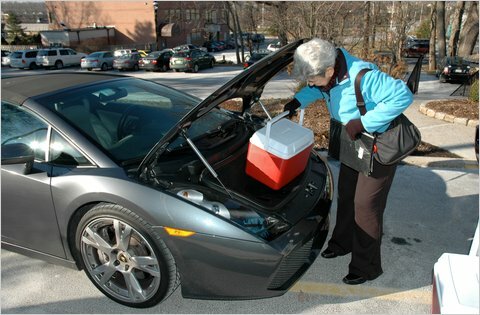 Event organizers hoped the partnership would raise public awareness of older people who are incapacitated or otherwise unable to leave their homes to buy food on their own..."
A nice little mention in Autoweek's 2010 Holiday Gift Guide - "Some of the things we wish for are fantastical, fanciful, far-out ideas that have no basis in reality.Â Others are more reasonable, actually possible to fulfill...Here are some out-of-this-world automotive wishes for the holidays..."
Press Sighting: "Hot meals on hotter wheels"
From today's Bergen Record:Â "John Foley usually delivers meals to seniors and the homebound as a volunteer with the Pascack Valley Meals on Wheels program in a 2005 Saturn.Â Monday was a little bit different. Instead of the Saturn, Foley sat in the front passenger seat of a black, 2006 Maserati Quattroporte...."